Emergency roof repair is something we take seriously. If you have been subjected to a storm, whether wind, rain or hail, and your roof has suffered, we will make the necessary repairs as quickly as possible — we are available 24/7 for your emergencies. We understand that the longer you wait to get it fixed, the more damage that has likely been done to your home or commercial property, which is why we recommend you call us immediately after a storm to get roof repair at any hour. Our roofers will look over your property and handle any repairs that are needed before they get more serious. We can also document the damages we find and help you to file the insurance claims that could help you receive compensation for any repairs needed. Call us right away and schedule a free inspection with one of our roofing contractors. We offer emergency roof repair services to handle those urgent situations that really can’t wait long to get addressed, such as a leaky roof, or a storm damaged roof. There are routine maintenance actions we can provide, and then there is emergency roof repair. When we are talking about your home having been hit by a storm, or a leak becoming evident, there’s no time to waste. You certainly don’t want any of those problems spreading, or magnifying. If they go on for too long, you could be looking at a roof replacement. Roof leak repair – when you have noticed water running through your home, it has likely started somewhere else and is spreading, leaving water damage in its wake. We will locate where the leak originated and handle it before it has the chance to ruin any more of your home. Storm damage repair – call us immediately after a storm to give us the best chance to document any possible damage for your insurance claim. If you wait to call us, the elements can hide damage from view, or sun-bleach it and make it difficult to discern. The earlier we are alerted, the more effective our inspection will be. Hail damage repair – hail can cause serious damage to your roof, and is easiest to be spotted directly following the storm. Depending on your roof type, it will manifest itself in different ways, but we don’t take any chances. Our roofers will do a thorough inspection for free to make sure your roof isn’t subjected to the cracks or leaks that can be brought about by one of these storms, and do any needed hail damage repair rapidly. If you think your roof may have suffered storm damage, or you have a leaky roof, call us immediately for emergency roof repair. One of our roofers will get out to do an inspection at any hour of the day (or night), and protect your home or business against further damages. 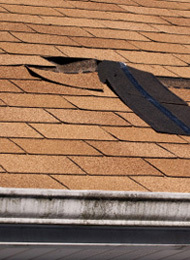 We handle emergency roof repair in Bentonville, Springdale, Fayetteville, and nearby cities.